Are you concerned about a tree in your yard or on your commercial property? Tree safety is important for keeping your family, neighbors, and customers safe. T & L Tree Service is here to make sure your unhealthy trees are inspected and managed properly for everyone’s safety and to reduce risk and liability. After a tree has been damaged by storms, disease, pests, or age, it is important to remedy the issue before it becomes an even larger risk. Falling branches can damage your home or business, anything on your property, a neighbor’s fence or house, or cars and neighboring businesses. 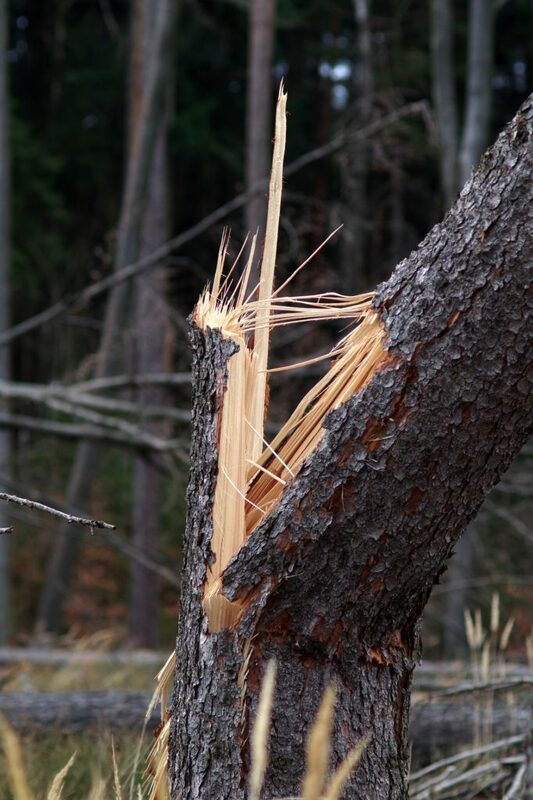 Damaged trees and limbs may also cause damage to nearby electric or phone lines. Our ISA Certified Arborists can inspect your trees’ health and provide a solution – whether that means treatment, pruning, or tree removal. In Missouri, our weather includes high winds, soft ground from flash flooding and heavy rains, lightning, and ice storms. Any of these weather situations can enable a dying or damaged tree to cause havoc to your property or your neighbor’s property. Whether it is one damaged or diseased limb or an entire tree that falls, most damage can be prevented with proper maintenance. We offer a wide range of tree and landscaping services to help. Our services often start with an inspection for diseases and pests including the Emerald Ash Borer, and may include removal of dead wood and limbs, pruning of trees and shrubs, and preventative seasonal maintenance for both safety and beauty. If an unhealthy tree or tree limb breaks and falls on your house or building, it could damage much more than the structure. It could pose a threat to your loved ones, family, and pets inside the home and to employees, clients, patients, and children in or around your business.